Another recipe found in the recent Recipe Spring Clean, courtesy of The Wednesday Chef. I’ve had this bookmarked for a while but, much like my clippings folder, rarely refer to my bookmarks when I’m searching for inspiration. I tend to cook something quite quickly after discovering it and the online “recipe” folder is typically where recipes go to die. I’m glad I found this one again though because it was brilliant. 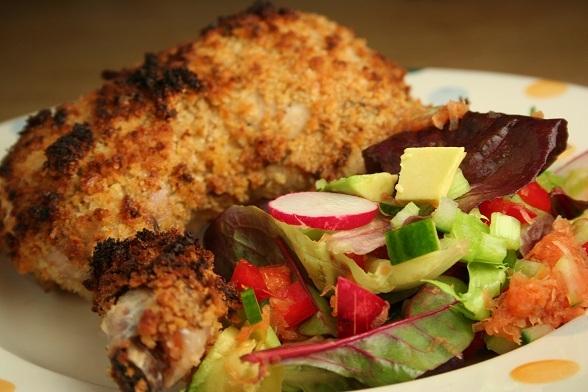 There’s a lot of mustard on that chicken but it melts away and provides really tasty crumbs. The original recipe calls for duck which I’m not sure about, pork chops would work very well though I think. Season the chicken with salt and pepper and then sprinkle over the dried herbs. Next, spread the mustard all over the chicken before rolling the chicken in breadcrumbs. Transfer to an oiled baking dish and then drizzle over the melted butter. Bake in the oven at 180 degrees for an hour or until the chicken has cooked through. Subscribe to comments with RSS	or TrackBack to 'Mustardy Breaded Chicken'.